Figure 10.1. Colorado River Indian Reservation. 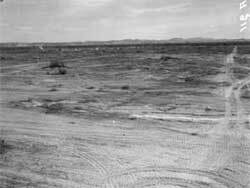 The Poston or Colorado River Relocation Center was located in La Paz County, Arizona, 12 miles south of the town of Parker. Poston was named after Charles Debrille Poston, the first Superintendent for Indian Affairs in Arizona. Poston was directly responsible for the establishment, in 1865, of the Colorado River Reservation, where the center is located (Figure 10.1). La Paz County is a fairly recent political entity; during World War II the Poston area was part of Yuma County. The Colorado River is about 2-1/2 miles west of the relocation center; this section of the Colorado River Valley from the relocation center vicinity north to Parker Dam is known as Parker Valley. At only 320 feet elevation, the area lies within the lower Sonoran desert. Summers are hot, and, because of the proximity of the river, humid; in the winter days are cool and nights cold. The Colorado River Indian Reservation Tribal Council opposed the use of their land for a relocation center, on the grounds that they did not want to participate in inflicting the same type of injustice as they had suffered. However, the tribe was overruled by the Army and the Bureau of Indian Affairs (BIA). In a verbal agreement the WRA turned over administration of the center to the BIA. The BIA considered the relocation center an opportunity to develop farm land on the reservation with the benefit of military funds and a large labor pool. The WRA took did not take full control of the center until December 1943. The Poston Relocation Center consisted of three separate cantonments at three-mile intervals. Known officially as Poston I, II, and III, the evacuees nicknamed them Roasten, Toasten, and Dustin. Construction on Poston I began March 27,1942, with the contractor Del Webb, later of Sun City fame. Del Webb had a large work force already mobilized for military contracts, and built Luke Air Force Base near Phoenix in March 1941. However, the relocation center was Del Webb's biggest challenge up to that time. Webb had a construction job in progress at Blythe, and when he got the contract to build the camps he diverted his crew to Parker. With equipment brought up from Blythe, the initial ground clearing was done in one day (Figure 10.2). Using 5,000 workers on a double work shift, Poston I was completed in less than three weeks (Figures 10.3-10.5). The pine specified for construction was in short supply, so heart redwood was substituted. When the redwood shrunk much more than expected, millions of feet of thin wood strips had to be ordered to fill the cracks (Finnerty 1991). 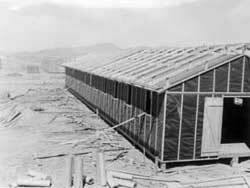 Because of the heat in Arizona, the standard tarpaper barracks construction was modified so that the buildings had double roofs. A new contract was awarded to Webb to build Poston II and III within 120 days (Finnerty 1991). Guard towers were not constructed at Poston, as they were at the other relocation centers; here they were considered unnecessary because of the isolated location, in the desert at the end of a road. Figure 10.2. Poston site partially cleared. Figure 10.3. 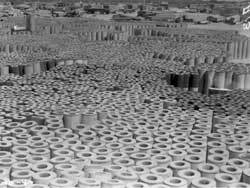 Rolls of roofing paper at the Poston site. Figure 10.4. 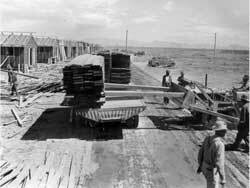 Unloading lumber at the Poston site. Figure 10.5. Construction underway at Poston I.